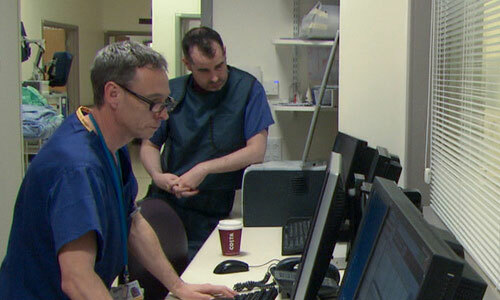 Scans are performed before treatment to quantify the size, number and location of tumour deposits in the liver. They also help with planning the SIRT procedure itself. Normally, all patients have a CT scan, sometimes with special arterial views of the liver, and many patients also have a MRI scan of the liver. Some centres also routinely do a PET scan before treatment if this may be helpful. It is important that scans are performed within a month of the planned treatment date so that the scans used to plan the treatment are accurate. A catheter is inserted into the groin and contrast is injected into the blood vessels that supply the liver. This angiogram specifically assesses the blood flow and maps the blood vessels within the liver. During this procedure, the radiology consultant doing the angiogram will block off ('embolise') any vessels that he/she thinks might represent a risk of microspheres going elsewhere in the body. Since they are non-essential arteries, there is no risk associated with blocking off these tiny vessels, but the procedure can sometimes cause mild pain or mild fever for a few hours afterwards, so the patient has to be monitored in the hospital for at least 4 hours. At the end of the liver angiogram procedure, patients have a special Nuclear Medicine scan (called a 'MAA Scan') to check the success of the embolisations performed during the angiogram procedure and to calculate the correct microspheres dose. Treatment with SIRT causes tumour cells to die and so we expect to see the tumour deposits we saw before treatment become smaller after treatment and have less blood flow. Although the treatment starts working straight away, and carries on working for weeks and months, the changes on CT scans after treatment can be misleading in the first few weeks. For this reason, follow-up scans are normally planned 2-3 months after SIRT treatment. The follow-up scans will normally involve another CT scan, and possibly a MRI scan or PET scan, depending on local practice. These scans show what effect the SIRT treatment has had, and help plan further treatment and follow-up.